still not on the owners list. oh well, i can be patient. does anyone know if the package will come with a copy of the window sticker or where i could get a copy of mine? i'm not the original owner, so i don't have it. This has been discussed in this forum, search the threads and you will find the email address of a person who works for Ford who will send you a copy free of charge. Also, for a fox bodied cars, there is a guy who posts at The Corral who makes nice reproductions of those. I (finally) got my cert.today. It's been adventurous to say the least, but at least it's here. It's got the information I wanted, and very much appreciate the guys at FPG who've gone above and beyond the call of duty to get my cert.in my hands. 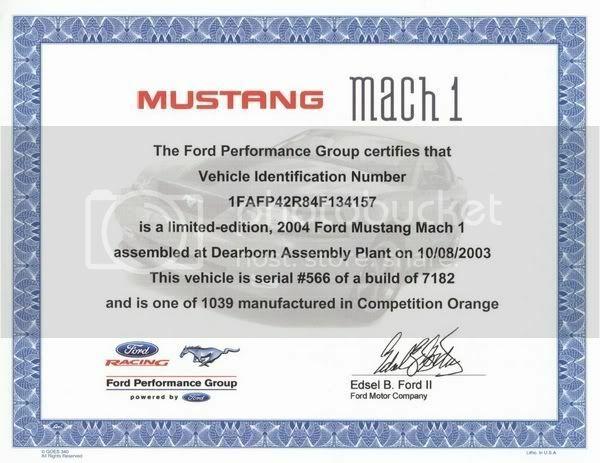 Now, the important stuff: the sequence number for the 2003 Mach 1s include the pre-production cars, which totals 53 vehicles. If you want to know what your actual production sequence number is of production Mach 1s, subtract 53 from the number given. It also means that there were 9,599 actual production Mach 1s built for consumer purchase in 2003. I would like to see a breakdown of the pre-production cars; colors, options, etc. I'd also like to know the fate of the NY Auto Show car, which was an 'X' code GT, not an R code car. Last edited by falcongtho3; 10-30-2008 at 10:15 PM. I got mine today, #3292, born on 04/01/2003, April Fools Day. Got my birth certificate yesterday ! I am #6863 of 9652. Born on 06/12/03. Also my certificate and all other papers in the DHL package came with a water mark covering about 1/4 of the pages.This includes a soggy envelope too. I called Ford and told them about this and they are sending me a another package ASAP. They were more than helpfull and apologetic even though it was not their fault. KUDOS to the guy who answered the phone after I pressed # 1. Last edited by mach one NY; 10-31-2008 at 04:45 PM. That car at the NY Auto Show had Bullitt side skirts on it . Its also the reason I bought mine in red. Got my birth certificate today ! I am #6863 of 9652. Born on 06/12/03. Also my certificate and all other papers in the DHL package came with a water mark covering about 1/4 of the pages.This includes a soggy envelope too. I called Ford and told them about this and they are sending me a another package ASAP. They were more than helpfull and apologetic even though it was not there fault. KUDOS to the guy who answered the phone after I pressed # 1. Never fails, when you are expecting something VERY important it rains....least this is replaceble.....I often get worried when I order something that I know is moreless impossible to get again. Tell me about it My Hemmings Muscle mag always comes when it rains. Last edited by mach one NY; 10-31-2008 at 04:44 PM. #1748 of 9652, birthday 02/04/2003. Car was born on my parents anniversary day. FYI - More names (almost 100) just sent in over the weekend. So if you just registered, check the Owners list to see if you made it, and give Ford a week or so to update. Got mine today also, very cool piece to collect....gonna laminate mine! 2003 Jack Roush Classic Stg 3 #34 of 46 Built! Not sure if it was just mine but the certificate read Dark Charcoal for exterior color. Meant to call them about it, but never got around to it. Great news is, as I walked throught the door, there is a package from FPG with the corrected info! Thanks to everyone involved and the wonderful people at FPG for the great customer service!!! Mine came in today too. may have put the INTERIOR Color (Dark Charcoal) not the exterior color...get a hold of them, they should correct it for you. Got mine yesterday, assembled 10/14/2003, #950 of 7182, Dark Shadow Grey. I will say it was nice to park next to the Cobra guys at the local cruise-in and display my certificate just like them. That seemed to get a new measure of respect for the car. Too bad I don't have their horsepower, I'll just have to settle for having a better looking car for now (other than the guy with the 2003 Mystic Cobra). Got my replacement paperwork yesterday,In mint condition,took 8 days for that to come.